Leading up to the election, some Texas voters are wondering why a debate between the candidates has yet come to fruition. 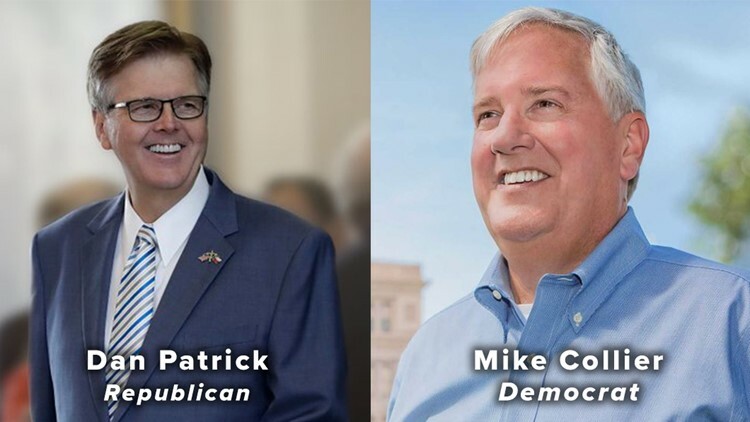 AUSTIN — Texas Lieutenant Governor Dan Patrick (R) is facing off against Mike Collier (D) in the November election. Lt. Gov. Dan Patrick was elected in 2014, winning the general election by almost 20 points. While he held office, the Senate passed legislation to increase support for border security and reduced the franchise tax -- a business tax that helps lower property taxes but also helps fund public education in times of low revenue -- by 25 percent. He also worked for property tax relief and law enforcement safety. He's additionally known for his sonogram bill and other measures against abortion in Texas. Before politics, Patrick held other positions such as radio host, television anchor and sportscaster. He's also known as a Christian author, musician and movie producer. Meanwhile, opponent Collier began his career at Exxon before finding his way to accounting firm Price Waterhouse Coopers, LLC. He worked in the auditing realm for 10 years before becoming partner at the Houston office, where he worked for an additional 10 years. He later helped build a successful Texas oil company, serving as CFO. Voters across the state have been wondering if Lieutenant Governor candidates Dan Patrick (R) and Mike Collier (D) would meet for a debate, especially after Patrick agreed to "debate" Fox News personality Geraldo Rivera. After appearing on the network, Patrick challenged Rivera, later tweeting he was ready to debate him. Patrick then tweeted, "Let me be clear, a 7-minute segment is not a debate." The announcement caught the eyes of many, including opponent Collier. Collier pointed out Patrick has avoided numerous press inquiries to debate his actual challenger in the race for Lieutenant Governor, including one from FOX 26 News in Houston. "I accept Fox’s offer and will expose Dan Patrick’s many failures as Lt Governor. You can’t raise property taxes, slash funding for public education, and waste everyone’s time on a hateful bathroom bill and NOT come forward and defend yourself," Collier said. Matt Mackowiak, a Republican consultant, called Patrick's lack of acknowledgment a strategic move for Patrick as the election gets closer. "If the lieutenant governor agreed to debate his opponent, he would be giving his opponent an advantage," said Mackowiak. "His opponent has almost no name identification across the state. He's raising very little money and getting almost no traction whatsoever."